Striving for Health, Beauty & Versatility in a small package. Many years back I bred German Shepherds and worked a little on Obedience and Personal Protection with my dogs. After losing my old gals very close together I grieved for awhile and decided dogs were a necessity to my life. But I wanted a different type of dog without a lot of grooming needed and one that would be a house dog in all ways. I went to a local dog show and was ruminating about the breeds I saw and had already researched, and somehow, none of them seemed just right for my future. Across a field of grass came a couple of women with 5 or 6 Italian Greyhounds on leash between them, and a bevy of colors from mahogany red to lovely blues. I was enchanted and managed to spend the whole day sitting at their setup within the expen filled with IGs. As it turned out that was a fortuitous day for me as I met Nona Molaison of Jo-Na-Da IGs and a friendship was begun. We spoke of her current litter, but I never imagined that within a month, as luck would have it, she would call and ask how strong my commitment was. At that time we struck a deal and a co-ownership contract for a blue and white Irish girl I named Lizzie. Now I’d shown hunter horses for years, but never stepped inside a show ring with a dog. 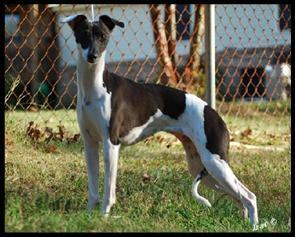 But the deal was that Lizzie was to be shown to her Championship and potentially later bred. Lizzie earned her Championship in about 2 years, despite having me on the end of her lead learning how to show simultaneously, and getting a lot of assistance from others. Since then a lot of things changed in my life as Lizzie taught me that there was no other breed for me. One of the most important things Nona taught me was to get my present dog completely housebroken and trained and bonded to me before adding any other dogs, and believe me, this breed cries out for more of their own in their home. I have tried to adhere to that advice and it’s served me well. And Lizzie bucked the reputation IGs have for not being housebroken. She was totally perfect by the age of 9 mos. In this breed that’s a fairly amazing thing. She then went on to help me train any new puppy that entered the household. As I kept hearing how amazing that was, to have multiple housebroken IGs, I penned an article that you can find elsewhere on my website called Vikki’s Housetraing 101. As I loved Lizzie’s amazing temperament, I added a half sister, Tessa next and though I decided to not continue to show her, she remains here and has been a wonderful babysitter to new additions, and is a quirky/bossy/funny little girl. The story goes on from there and you can guess the rest. Hence my brood of IGs. 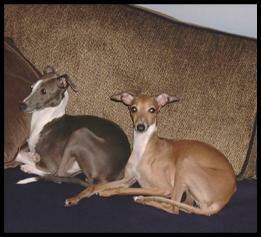 After showing and learning I became member and later, Secretary to the Northern California Italian Greyhound Club. I’ve learned much along the way and brought my other gifts and experience to showing, being a Board member, and later adding our newest addiction, LGRA / NOTRA and Lure Coursing the girls. We do like to keep active and my girls took naturally to these sports. 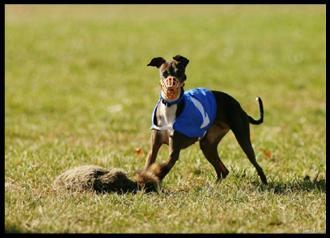 I never in a million years dreamed of showing a Sighthound or knew what Racing and Coursing even were. Until my club put on an IGCA Regional Specialty which included LGRA (racing). Lizzie did a practice run, then another, then another and we were both hooked on the spot. We ended up entering that day although not in perfect condition, Liz was well muscled. And lo and behold she came in 3rd. out of 19 dogs and earned her very first GRC points. She was a Natural, though I recommend more training first for these sports. That did it for me. To see that panting happy smiling dog catch her first “Bunny” was amazing. A lot has happened since then, but one by one, my girls have been ‘bitten’ by the racing bug and all earned points and titles along the way. Visit our Racing pics and Performance pages for more info on other sports for IGs. I joined some on-line forums, some good, some bad, and I learned through trial and error and others’ experiences what life with IGs was all about. I learned about the health issues in this breed (all breeds have them), and how important health testing was, and striving to breed the best IGs you can by keeping the breed standard as your goal, and by matching dog’s pedigrees to each other, and trying to minimize the health risks as you go. 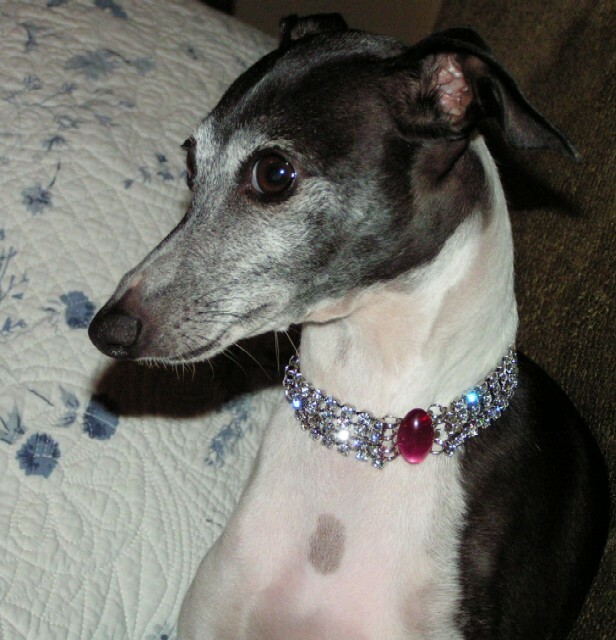 I became a member of the Italian Greyhound Club of America (IGCA), as well as being their new Versatility Chairperson, and have remained Secretary and active in my local club, helping host Matches/Specialties/Sweepstakes/Race events/Hospitality Chair. And there you have it….. IGs have wormed their little way into my life and into my bed forever. I can’t imagine any other breed fitting as well in my life. ANY and ALL Photos or Content on this page and all subsequent pages is Copyrighted for my own use. ANYONE found to be using either will be prosecuted to the FULL extent of the Law. On occasion we may have puppies available. We do not ship puppies and home visits are required. Please feel free to e-mail us at: vikki@dfollyigs.com Click below for our current litter.